Mentoring/Discipleship - Knowledge of what a Biblical woman should be; possess the ability to connect with the women of MCF, to grow in relationship with them and have a positive influence. NOT a feminist. We need someone who can encourage the guys as well and not give women a typical feminist attitude that undermines or attacks men. Salary, benefits and housing allowances are negotiable. The successful candidate will need to fundraise to help support the ministerial aspects of this position. Murray Christian Fellowship is a forty five-year-old ministry located on the campus of Murray State University, Murray KY and is supported by Restoration Movement congregations with a growing active alumni family. There is a creative, joyful staff of students and a full-time Campus Minister. Approximately 30-50 students are involved in MCF activities each semester. There is almost a 3:1 ratio of female students to male students within the Fellowship. For answers to specific questions, or to submit a letter of interest in the position please email Murray Christian Fellowship Campus Minister Mike Kerrick mike@mcfhouse.org. All applicants must submit a resume, a statement of faith and 3 references. Those selected for interviews must consent to a background check. Applications will be accepted until the position is filled. Mike came to MCF in 2008 after several years of youth and college ministry within the local church. He grew up with a blend of Baptist and Roman Catholic heritages, settling in the Restoration Movement churches (what a natural fit). He attended Rose-Hulman Institute of Technology before transferring to Milligan College, where he received a BA in Bible. He went on to Emmanuel Christian Seminary and received a general MDiv degree. He has served on the mission field in Mexico, Brazil, and Kenya! He ministered with college ministries and rural churches in IL, IN and TN as well as with suburban churches in the Chicago area. He enjoys food of all kinds, sports of all kinds, stories of all kinds, movies of all kinds, music of all kinds and never turns down a cup of coffee. His passion in ministry is to see people go deeper in their love and understanding and life with Jesus through real healthy relationships, spiritual formation and community living. 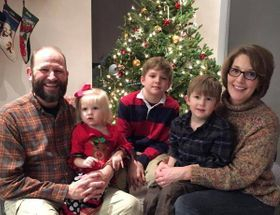 Mike has been married over 15 years to Dr. Sarah Pierson Kerrick, whom he met at Milligan. Sarah has worked at Murray State's Counseling Center as a Psychologist, but has now started her own psychological assessment practice. She is a wonderful cook, mother, mentor, gardner, volleyball player and friend. They have 2 boys and a little girl! Pierson and Joel are students at New Covenant Christian Academy and are active in soccer and baseball. They enjoy Legos, playing the Wii and Minecraft and being brothers and big BIG brothers to Rebecca. As the little brother, Joel is wanting to do everything Pierson does. He also likes Angry Birds Star Wars (both on the iPad as well as the figurines - well and anything else he can imagine knocking down those mean pigs!). Both boys love stories, reading and getting dirty outside. Little sister Rebecca Avalyn joined them in the Spring of 2014! She is a bundle of joy, energy and can that girl dance, sing and cook!!! It will be exciting to see what she continues to bring to the family! MCF is a part of the Association of College Ministries.